Ever since my husband and I bought our home in 2012, we have been entertaining ever since. We have hosted Christmas Day in 2012 and 2013 (2014 was a little busy with a 3 month old baby), a 30th birthday party, Adalyn's first birthday party, New Year's Eve and more! This year, we are hosting Christmas Day again for Troy's Dad's side of the family and my immediate family which ends up being about 35 people- it is very busy but amazing! I love hosting for Christmas. It is a ton of work ahead of time but once everyone gets there, I can relax and enjoy time with the family. The reason that I can do this is by prepping everything ahead of time. These tips and tricks are what I do to make it so that I can enjoy entertaining instead of wanting to pull my hair out. We always start deep cleaning our house the weekend before Christmas to get it ready for the party. Troy and I are pretty crazy about getting things as clean as possible so we spend about a week cleaning for the party. We wash the floors, deep clean the bathrooms, dust all surfaces, vacuum, etc. Starting ahead of time will make it so much easier and you will feel less crazy as the date of your party gets closer. Making lists is what keeps me sane. If I do not have everything written down, I feel like I will miss something. I have a list of who is coming, all the food I want to make, a shopping list and a cleaning list. I love using Google Docs to keep everything organized so I can just print it out and make changes as needed. The best part is when you are finished with a task, you get to cross it off and it feels so good! 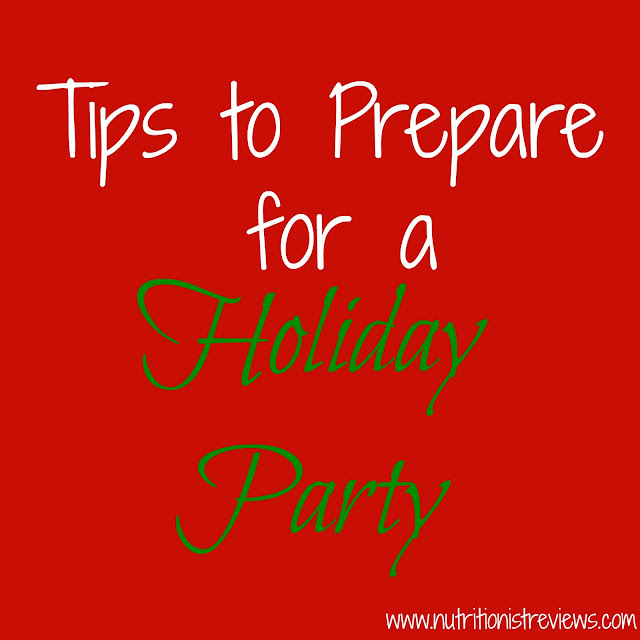 If you are throwing a large party, there is no reason that you have to do everything yourself. 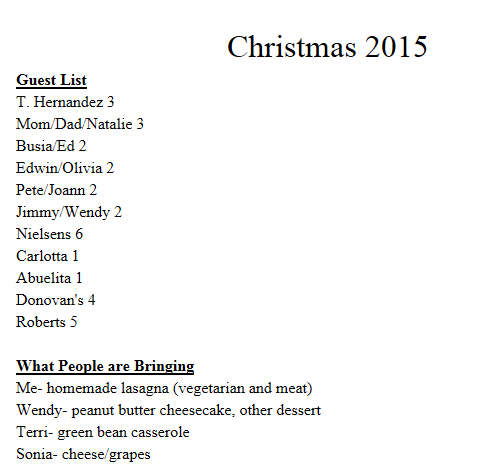 Troy's family has had their Christmas party as a potluck since long before I was around and it is a great idea. You just have everyone bring a dish and that way, you do not have to feel totally crazy about cooking for 35 people. Last year, Troy's Aunt had a chili party where there were 3 different kinds of chili, salad, cornbread and a few other things. It can be fun to have a theme or just have everyone bring what they feel like making. This year, I know that I am making lasagna as the main entrée for Christmas day. Since it is a lot of work to make a lasagna (at least the way I make it with a ton of vegetables, homemade sauce, etc. ), I will make them ahead of time. Lasagna freezes well so Troy and I will make a bunch of lasagnas in the next couple of weeks and then freeze them until Christmas day. This helps it so I can focus more on cleaning and picking up last minute items that I need for the party. During a party, the last thing you want to do is run around your house looking for another roll of toilet paper or paper towel. To make sure that I have everything I need for my party, I stocked up on Viva paper towels, Scott and Cottonelle toilet paper and Kleenex from Walmart. By having everything I need ahead of time, I will not have to think about it during the party! For great deals on these items at Walmart, use the Ibotta app for money back.